Innovation starts with desire, a need, and resources. Brian Fulton, owner of Goose Gear, which makes premium storage solutions for off-road adventure vehicles, wanted to get his daughter out on the trail with him to experience her own outdoor exploits. This desire spurred the need to bring the comforts of home on the road, and luckily, he had the resources to make it all come together in his custom cabinet shop. 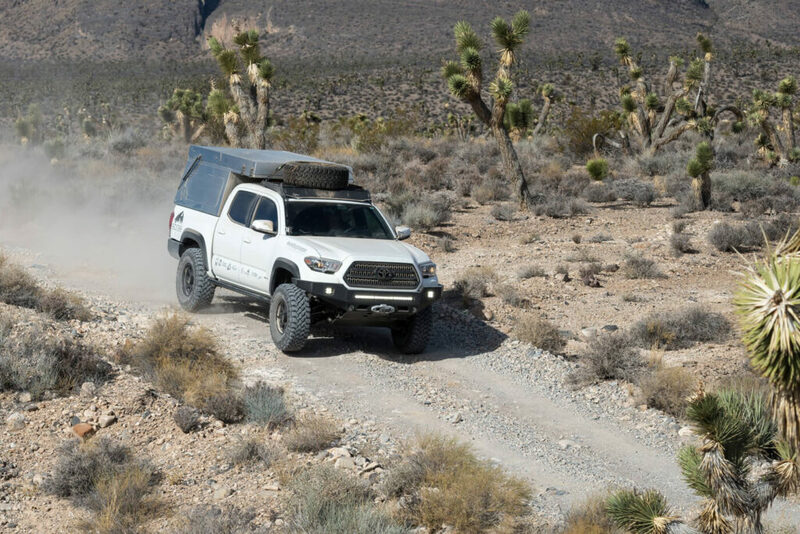 A full living-quarters system designed specifically to work on a Toyota Tacoma outfitted with an AT Overland Habitat bed-mounted shell. 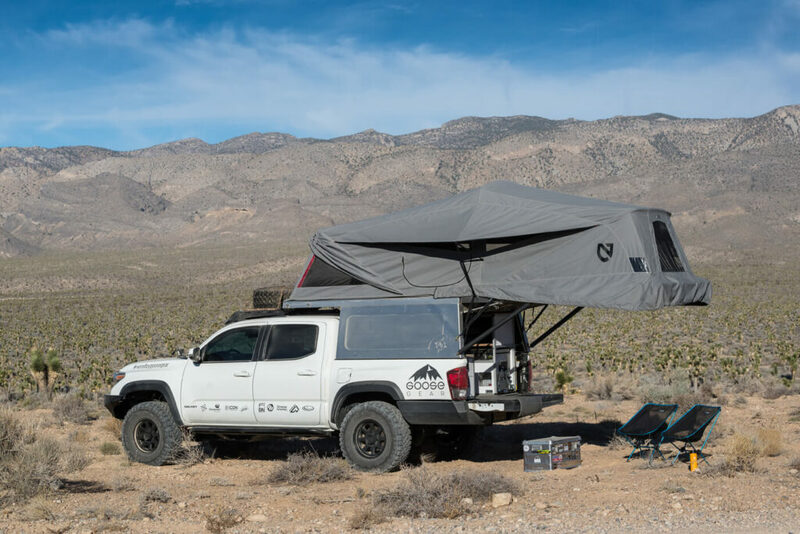 The pinnacle of Goose Gear’s quality offerings is a full truck bed living-quarters system that’s designed specically to work on a Toyota Tacoma outtted with an AT Overland Habitat bed-mounted shell. The combination of the Habitat and Goose Gear’s system has all the makings to create a cozy and comfortable home on and off the road. Let’s delve deeper into the example featured here, which is actually Goose Gear’s test mule and Fulton’s personal overland adventuremobile. Goose Gear got its name from Fulton’s daughter, now twelve, whom he nicknamed “Goose” when she was a baby. Fulton and his business partner Matt Hebel, who both saw their children getting older without having epic adventures with their families, founded the company to rectify that situation. 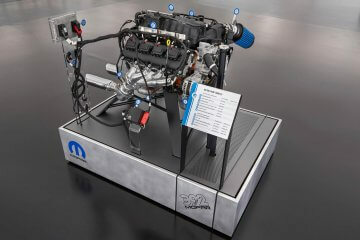 After making their first drawer system for the back of Fulton’s 2007 Tacoma in only a few hours’ time utilizing CAD software and a precision CNC machine, the pair knew they were onto something. 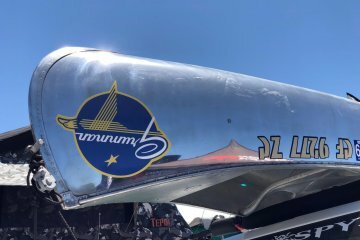 They posted a video of the CNC mill in action and some photos of the finished products and CAD les online, which quickly garnered enthusiasm for the product, resulting in their first orders. The AT Habitat housing the Goose amenities is available for second- and third-generation Tacomas. There seemed to be a need in the overland and off-road marketplaces for high-quality custom cabinets for adventure vehicles. By using excess machine time in Fulton’s custom cabinet shop, the two businessmen were perfectly positioned to ll this need. Fueled by their initial success, Fulton sold his daily driver work truck and built out a 2004 Toyota 4Runner, both to use as a test bed for the new company and as an adventure vehicle to get his daughter out on the epic trips he had dreamed of. While the 4Runner was a great introduction to the off-road world for his daughter, Fulton realized that he needed more space and more of the comforts of home in order to keep his young daughter’s interests in traveling into the backcountry with him. After Fulton searched far and wide for a suitable truck to base his new build on, the 2016 Toyota TRD 4×4 Tacoma became the obvious choice. 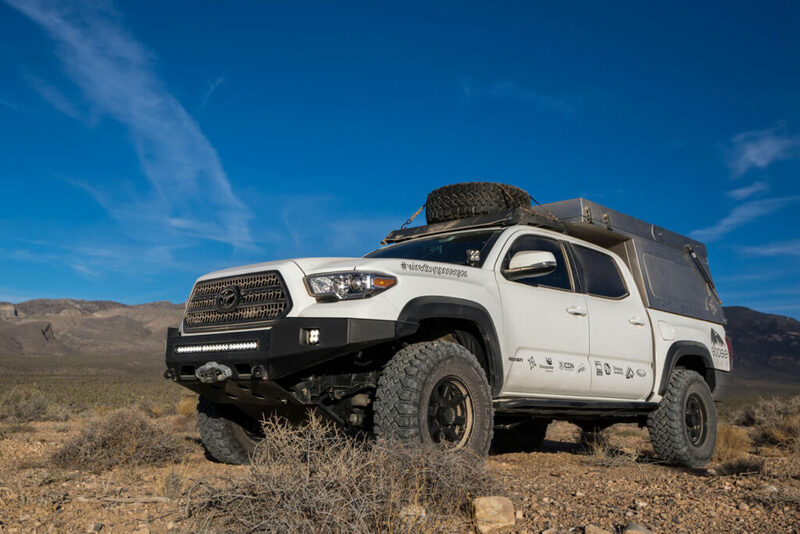 He attended the public unveiling of the AT Overland Equipment Tacoma Habitat at the American Adventurist Desert Rendezvous, where he spoke in-depth with the Habitat’s designer, Mario Donovan. It was this event that nally sold him on the Tacoma. Goose Gear had already assembled a number of similarly styled builds in the past, so Fulton already knew the capabilities and opportunities this type of vehicle would offer. 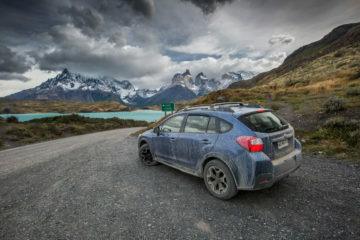 The videos from Expedition Overland, a Toyota-sponsored overland expedition team that puts out top-quality travel videos online, introduced Brian Fulton to the overlanding world. Expedition Overland received the rst production AT Overland Tacoma Habitat for use on a big Alaskan video shoot and adventure, and chose Goose Gear to outfit the truck. The company has since become a sponsoring partner of the Expedition Overland team, and as Fulton says: “It was really awesome to go from an observer and straight to the ‘rock stars’ of the industry in such a short period of time.” The experience gained working on the Expedition Overland Tacoma gave him even more ideas of how to refine a system that would fully realize the potential of the AT Overland Tacoma Habitat system. This potential has come to fruition in Fulton’s personal Tacoma build, which is also the prototype for the ultimate iteration of the Goose Gear Habitat living/storage system. The system is continually being upgraded and improved, but at its core is the Goose Gear Plate System, a custom plate for the Tacoma truck bed that’s bolted to the truck featuring built-in anchors for securing Goose Gear Modules. The standard Goose Gear Habitat system is made up of four modules and the plate. The four modules consist of a refrigerator cabinet module, sink/storage module, storage cabinet module, and a double-drawer module. The fridge cabinet is installed at the rear passenger side of the vehicle and allows for refrigerator access inside and outside the rig; it has a cutting board/shelf atop the fridge unit and offers an interior countertop at standard countertop height. The four modules consist of a refigerator cabinet module, sink/ storage module, storage cabinet module, and a double-drawer module. Goose Gear’s folding seat design provides comfortable seating for three and allows for great views out of all the Habitat’s windows. The sink/storage module is also mounted on the passenger side of the vehicle and offers up a stainless steel sink, two upper storage shelves, and a large lower storage shelf that stores the Thetford 550P cassette toilet. Under this module there’s an area that houses a water heater, water pump, and all necessary wiring and plumbing. The storage cabinet module is located in the front driver’s side of the truck bed; it houses a Propex heater, Odyssey house battery, Blue Sea fuse blocks, and dry storage above these systems. The double drawer module resides at the rear driver’s side of the truck bed. 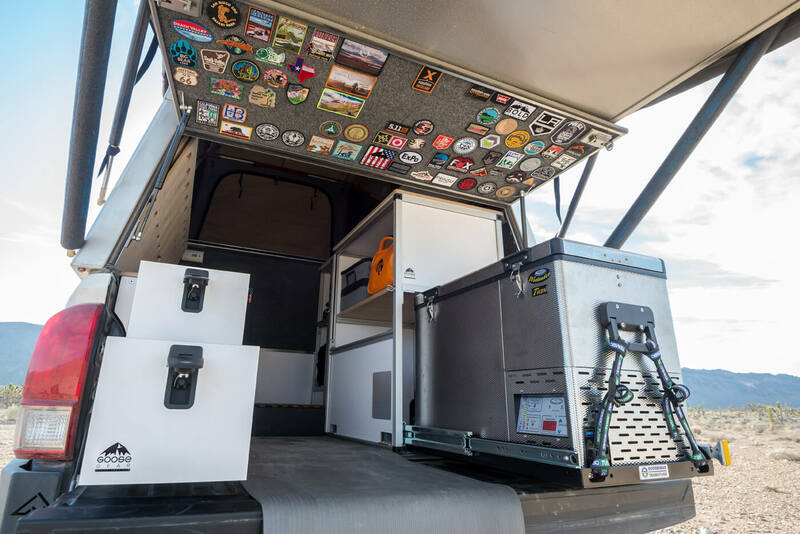 It utilizes Goose Gear’s new premium aluminum drawers and features the TrekPak organizing system. The drawer module also features a removable lid for access to the top drawer from inside the truck bed or when the tailgate is closed. While each of these modules is useful in and of themselves, the entire system combines to create a comfortable ergonomic “habitat” within the truck bed and under the flip-open Habitat roof behind the vehicle. 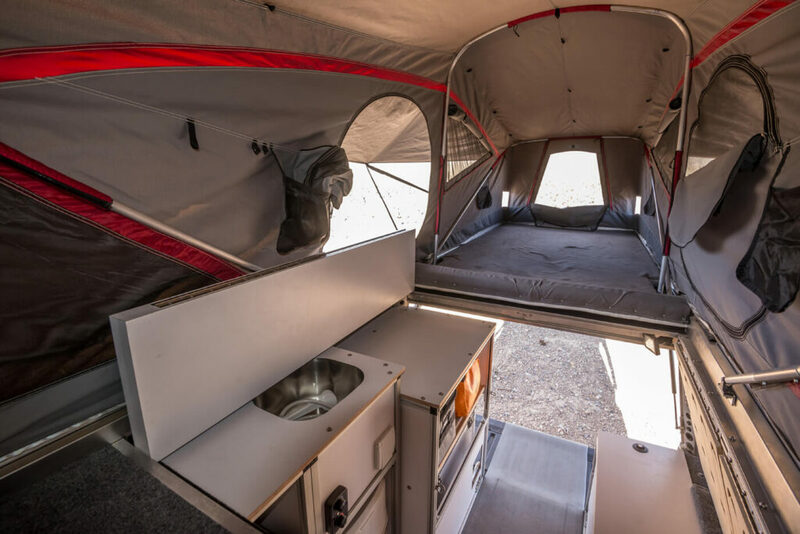 Besides the obvious advantages of the AT Overland Tacoma Habitat system, like being able to stand upright inside the truck bed with a roof over your head (even if you’re a 7-footer), the Goose Gear Habitat system adds the ability to comfortably seat four to five adults inside. 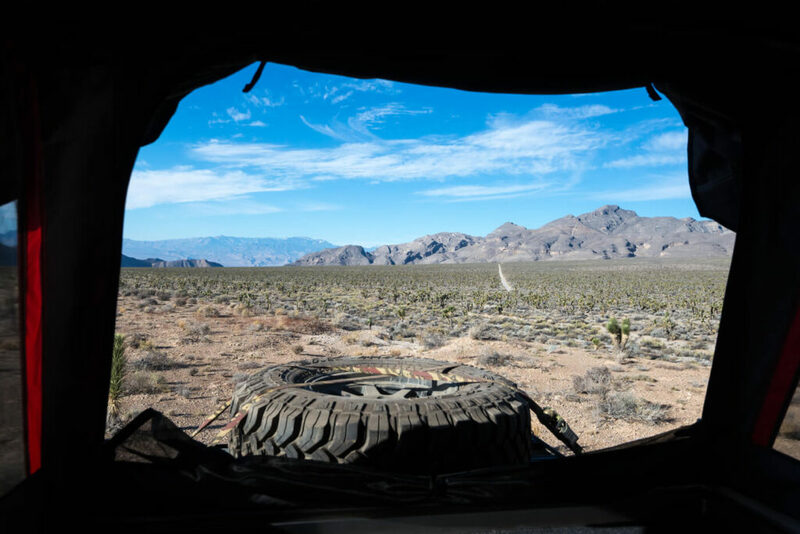 Goose Gear has developed a unique folding seat design that provides comfortable seating for three that also allows for great views out all of the Habitat’s windows. Using Baltic birch plywood and aluminum extrusion, Fulton was able to create these compact seats while only adding 22 pounds of weight and taking up very little interior space. Going beyond the “basic” Goose Gear module setup, Fulton also decked his Tacoma out with detailed features and little touches that add to the comfort and livability of the system. One detail that truly elevates the build is the folding sleeping/desk platform over the sink. This creates a comfortable place for a third person to sleep and doubles as a desk to use in conjunction with the aforementioned folding seats. When not in use, it folds out of the way for sink access while also providing a catch for the Nemo tent material when the Habitat is closed. Even more comforts of home are built in thanks to the availability of hot running water, a Propex Heatsource propane hot air heater, lots of LED interior/camp lighting and a National Luna Weekender 50L Dual Zone Fridge/Freezer. For the ultimate luxury when out in no man’s land, a Bullet Lined Baltic Birch shower pan was installed for use in conjunction with the on board hot water for showers inside the rig. To finish off the living space, nearly every surface was carpeted to create a temperature insulation barrier while reducing noise and create a homier feel. Getting in and out of the truck bed can be cumbersome, but Fulton devised a simple yet elegant solution. He took an Alu-Box aluminum storage case that ts perfectly in the aisle of the Goose Gear Habitat system, added a Bullet Liner covered wood top, and uses it as a step. It also doubles as storage for camp chairs, leveling blocks, a sand mat and stakes. This keeps these key camp setup components close at hand, and keeps the dirt they can bring with them out of the living space. 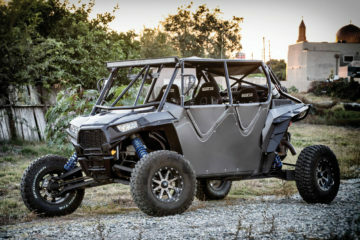 While the engine and transmission haven’t been touched for reliability reasons, there isn’t much else that hasn’t been modified for o-road adventuring. 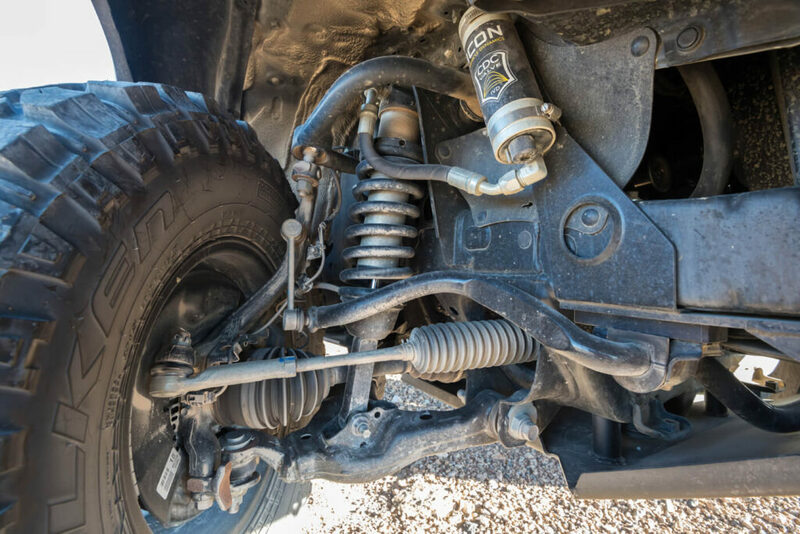 While the engine and transmission haven’t been touched for reliability reasons, there isn’t much else on this Tacoma that hasn’t been upgraded or modified for off-road adventure travel. Whether fully loaded for an expedition and bombing down rough off-road tracks or stripped down and cruising busy city streets, the Icon Vehicle Dynamics CDC Stage 6 suspension system keeps this Tacoma comfortable and controllable. With quick easy adjustments on the 2.5” remote reservoir shocks, Fulton says the suspension system is one of those things “you don’t know what you’re missing until you know what you’re missing.” Fulton also loves the off-road capabilities, low highway noise, and on-road feel of the Falken Wild Peak M/T tires in 285/75-16 size wrapped on XD Wheels. Lighting up the night is not a problem with this build, as it’s fitted with a full compliment of Baja Designs LED lighting solutions. A nice little useful touch is the two ditch lights mounted on CBI Offroad brackets over the hood, a 100% bolt-on addition. Area lighting around camp is sorted with 4 LuminAid Packlite NOVA solar powered led lights. To finish off the capability upgrades on this build, Fulton added a Warn 8,000-pound synthetic line winch—just in case he finds himself stuck in a sticky situation. The electrical systems on Brian Fulton’s Tacoma are all top-notch and beefed up over stock. 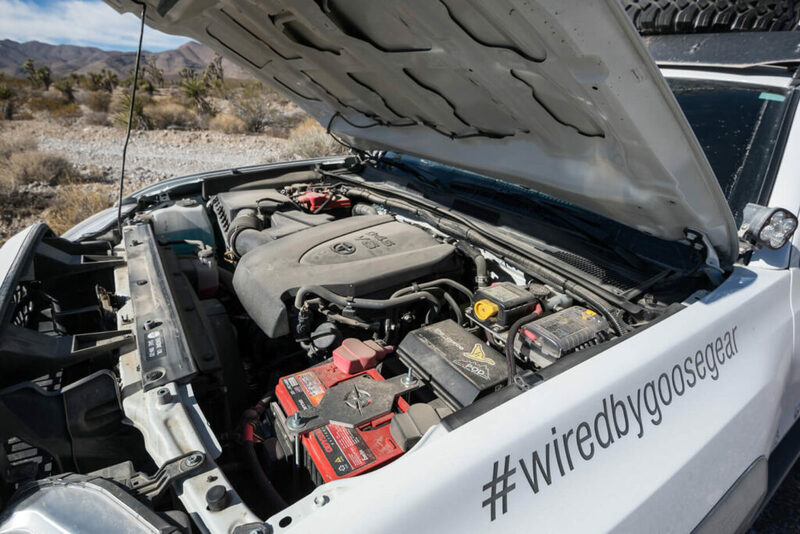 Under the hood, the starter battery was upgraded to an Odyssey Group 34, along with the addition of a second battery using Off Grid Engineering’s dual battery tray, which is controlled by a National Luna Battery Control system. The second battery powers all USB and power ports inside the cab along with all LED auxiliary lighting. Another house battery is also installed in the truck bed and isolated from the main batteries by a Blue Sea ML-ACR battery isolator. This cell supplies all power needs inside the Habitat: USB outlets, 12v outlets, water heater, interior and camp lighting, fridge/freeze and heater unit. All auxiliary electrical components are controlled and monitored through two units, one mounted in the cab and one in the Habitat, sPod Touch 8 Circuit SE System. To keep all the batteries topped off around camp a FlexoPower Attacama 79 exible solar kit is utilized, which even has a plug-in port mounted in the rear bumper for ease of use. If seeing this build inspires you to do a bit of adventure-seeking with your family too, it’s good to know that the AT Habitat that houses all the Goose Gear amenities is available for 6-foot bed, second generation Tacomas as well as 5-foot bed third generation models at a starting price of about eight and a half grand. While Fulton’s Tacoma build might never be “finished,” as it is the Goose Gear test bed, it’s already a truly formidable compact off-road overland vehicle. One upgrade that will transform this build even more, and is happening soon, is the addition of a Pelfreybilt rear swing out tire carrier bumper, which will get the spare tire off the roof and provide a place to mount the propane for the Propex heater. Small touches like the addition of an exterior camp shower are also in the works. No matter the state of the build, you’re sure to find Brian Fulton out adventuring with his daughter Goose all across America’s back roads. Editor’s note: A version of this article first appeared in the March-April 2017 print issue of Tread Magazine.